Sophronia is back in the third installment of the Finishing School series, set in Victorian England in a world full of Werewolves, Vampires, and secret spies bedecked in all things steampunk. The Finishing School series is a Young Adult series which I highly recommend to teenage girls or those adults out there who just enjoy a good supernatural fiction novel. 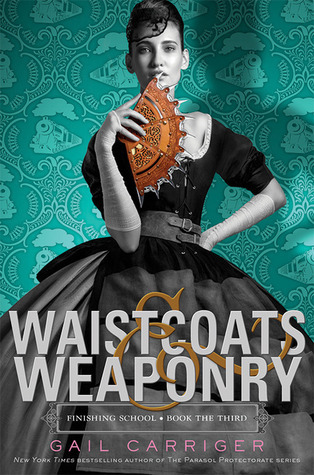 Waistcoats and Weaponry centers around Sophronia’s group of friends, who decide to go on a mission to save Werewolf-kind, prevent the Vampires from taking over the world, and evade the Flywaymen in the process. Naturally this would include commandeering an air dinghy (dirigible) and a passenger train in the process. And let’s not forget, the ladies have recently learned the art of flirting during their studies at finishing school, so naturally they must put their new skills to use to help in their endeavors. 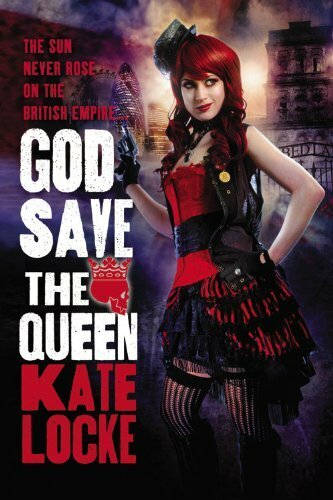 Gail Carriger is a favorite author of mine-I love steampunk, but more than that, I just adore the silly humor laced into the stories, which mash up the world of Mary Poppins and Indiana Jones and ties it together with automatons, various robots and flying contraptions and all that comes with steampunk genre. If you’ve been meaning to get a Gail Carriger novel but haven’t gotten around to it I highly recommend that you do so. You won’t regret it. 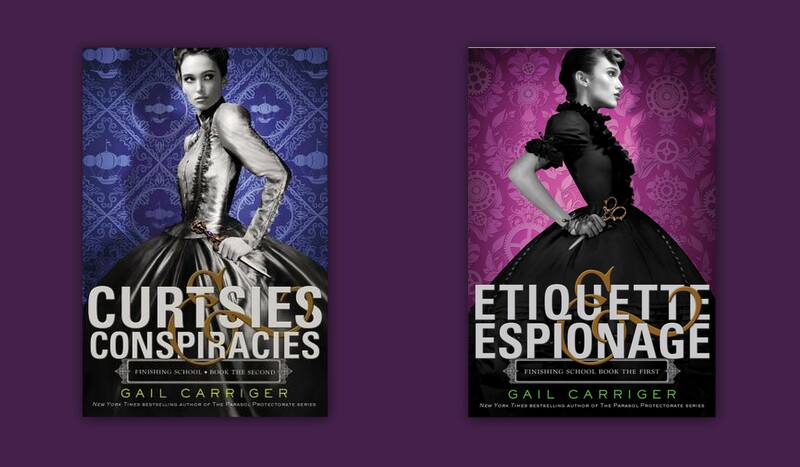 The Finishing School series, by Gail Carriger, is set in the same world as her previous series, the Parasol Protectorate. The first two books are Etiquette and Espionage, and Curtsies and Conspiracies. The Finishing School Series has been adopted as Teen Fiction but will be enjoyed by anyone who loves to read paranormal fiction. The heroine of the series is Sophronia Temminnick, a 14 year old girl whose mother wants very badly for her to go to finishing school and learn to become a young debutante and lady of society. Sophronia, however, would much prefer her usual activities : spying on people, climbing the dumb waiter shaft, playing with newfangled inventions…When the headmistress for a finishing school appears with the intention of taking Sophronia away with her, the young woman has very mixed feelings. But Mademoiselle Geraldine’s Finishing Academy for Young Ladies of Quality is not quite what it seems…The school is actually a training academy for espionage operatives-just for young ladies of course, the boys have their own school. Sophronia has finally found her calling in life, but there are some mysteries aboard the floating school that she cannot resist sorting out for herself-especially in this new world where she is surrounded by paranormal beings. These novels are very fun, and the audiobooks are really enjoyable too.